Men reached the moon in July 1969, and Woodstock began three weeks later. With the benefit of hindsight, we can see that this was when the hippies took over the country, and when the true cultural war over Progress was lost. My idea – and it’s a rough one – is that there’s a hierarchy of innovation that runs in parallel with Abraham Maslow’s famous hierarchy of needs. Maslow argued that human needs progress through five stages, with each new stage requiring the fulfillment of lower-level, or more basic, needs. So first we need to meet our most primitive Physiological needs, and that frees us to focus on our needs for Safety, and once our needs for Safety are met, we can attend to our needs for Belongingness, and then on to our needs for personal Esteem, and finally to our needs for Self-Actualization. If you look at Maslow’s hierarchy as an inflexible structure, with clear boundaries between its levels, it falls apart. Our needs are messy, and the boundaries between them are porous. A caveman probably pursued self-esteem and self-actualization, to some degree, just as we today spend effort seeking to fulfill our physical needs. But if you look at the hierarchy as a map of human focus, or of emphasis, then it makes sense – and indeed seems to be born out by history. In short: The more comfortable you are, the more time you spend thinking about yourself. The focus, or emphasis, of innovation moves up through five stages, propelled by shifts in the needs we seek to fulfill. In the beginning come Technologies of Survival (think fire), then Technologies of Social Organization (think cathedral), then Technologies of Prosperity (think steam engine), then technologies of leisure (think TV), and finally Technologies of the Self (think Facebook, or Prozac). This entry was posted in Uncategorized on May 14, 2012 by Nick. Or we have an incumbency problem. Innovation gets squashed by those threatened by it. Or, rather, if their revenue streams are threatened. Think Big Oil killing green energy, climate change, etc. You’re the anti-Thiel, blaming not the hippies but the suits. But I don’t buy it. Incumbency obstacles were arguably greater a century ago (check out Edison’s efforts to squelch AC power) and the obstacle-breaking forces were weaker. Nick – A good, thoughtful post. I love the hierarchy. I think there’s an element of simple “raw material” in all this–it’s hard to beat suddenly-available and affordable electricity, instant communications via telegraph/phone and the internal combustion engine if you want “meta-innovations” to change the world. There’s also a sense that innovations 1880-1920 knit the county together, from the sewing machine to the auto. In “Search for Order,” Robert Wiebe makes the point that the two great bursts of railroad construction in 1879 and 1885 were feeder lines–essentially creating a national market. I have a sense that the innovations we treasure most today splinter the market (everyone listening to his own iPod, watching his own screen), which can make 1+1=1.5 sometimes and leave the entire era feeling flat. I do think if our entrepreneurs knew a little more history they wouldn’t be so amazed by the times. But laws are easier to bend and write in their favor nowadays since we have only the two Republican parties: Republican Ultra Right and Republican lite. PS. Orda, lack of viable green energy options is not caused by “Big Oil squashing”. The reason is that it is EXPENSIVE. Way more expensive, then fossil fuels at the moment. The second reason is that there’s simply not enough of it to go around: even if we cover all the available surface with solar panels and windfarms, it would still not be enough to power US economy. Which inventions of the last 100 years are overshadowing an even more important invention of recent years? I agree with the premise that innovation hasn’t disappeared just morphed. However I think it has to do more with the relative impact of innovation on the culture/economy/human activity. When you invent the basic form of something (the combustion engine) the impact is dramatic from zero to 100! When you invent the hybrid electric/gasoline engine maybe you go from 100 to 200, but it’s only 1/2 the change versus the original innovation. As you climb up the curve, improving by 100, becomes a smaller & smaller per centage increase. You are no less innovative, but the impact becomes a smaller and smaller part of the whole, so it seems like less innovation. Oh, we’ve got more innovation in our milieu’s little finger than all of the previous five centuries combined. Make the atom bomb look like a kindergartner’s three-word essay. The real breakthroughs today are in ‘financial innovation’, in crime obfuscation through derivatives and the like. Media innovation: the modern mainstream (CNN, Fox, MSNBC, et. al.) makes Goebbels look like a hack infomercial salesman. Monopoly maintenance innovation: the biggest trusts, the Rockefellers of yore are like lemonade stands compared to the Masters of the Universe today. Who, unlike the small-time “Robber Barons” of the Industrial Age, have innovated so brilliantly that despite having completely destroyed all semblance of competition in everything from banking to agriculture to soft drinks, they remain unchallenged by the Sherman Act or any other antitrust suits, having solved the riddle of corporate immortality. They fear no Roseveltian trust-buster and manage to roll back all the labor rights progress made in the 20th century. The monopolies of the past had fractions of a percent in terms of inflation adjusted wealth, power and influence compared to the completely global, multi-government-owning, nature of the ‘white-shoe boys’ that head JP Morgan, the Fed, and Wal Mart today. That kind of hard-won innovation takes the Best Minds of A Generation; armies of thinktanks, lawyers, stock traders, quants, politicians, marketers and other psychopaths innovating round-the-clock in an arms race of theft, exploitation, and market manipulation. How we have managed to prop up Too Big To Fail capitalism from collapsing when we’ve got 2-3% of the people producing all the food and manufactured goods we need, spinning 97% of the economy in zero-sum feudal “wealth-defense” jobs like marketing, law, financial services, and “service industry” (also superfluous marketing in essence). That is the last half-century’s tour-de-force, the boomers’ gift to humankind. Now excuse me while I dine on my austerity sandwich. The innovation drought idea gets (substantially) less plausible the further back in time it’s extended. The last decade? Maybe. The second half of the twentieth century? Not even close. Nonstop transcontinental and transoceanic air travel, helicopters, general-purpose credit cards, television, photocopying, digital photography, portable video cameras, recorded movies at home, computer-aided drafting, GPS, laser range-finders, communication satellites, weather satellites, portable music players, portable radios, mobile phones, barcode scanners, airbags, safety glass, thermal-pane windows, home air conditioning, anti-lock brakes, pacemakers, synthetic heart valves, joint replacements, contact lenses, CAT scans, MRI, arthroscopic surgery, laser surgery, Kevlar vests for cops, Nomex suits for firefighters, vaccines against childhood diseases . . .
All of that was invented between 1950 and 2000, and the list could easily be doubled or tripled by bringing in computer-related innovations and “marquee” technologies like hydrogen bombs, ballistic missiles, and the interstate highway system. Maybe the social impact of all that is less than the social impact of the innovations of 1890-1950 (I’d argue it’s equal or greater), but . . . I just don’t buy the case that innovation itself dropped off after World War II. Great post. The industrial economy entrenched itself as the 20th century progressed. With that, the stories mother culture told us about how to make a living also changed. More than ever, we ceded our lives to institutions – educational, governmental and business. Get a good education, then a good job, then be a happy family with a easy 30yr mortgage. Easy availability of this kind of ‘soma’ reduced the appeal of a high risk strategy of striking out on one’s own. Most of today’s innovators work for a salary and most of the patents are in the name of corporations. Nick – great post with one omission, arrogance. As a culture we are too arrogant to think that we can come up with a better more meaningful way to power automobiles, or build better mass transit systems, or transport goods and services to avoid polluting the atmosphere and our oceans. We are so far removed from knowing what it means to live in a world where innovations such as air conditioning and indoor plumbing move into reality that we get excited when our Internet speeds increase a fraction. You are right, we have become very inward looking and if history has show us anything, it is that this is usually the beginning of the end of our culture as we know it. 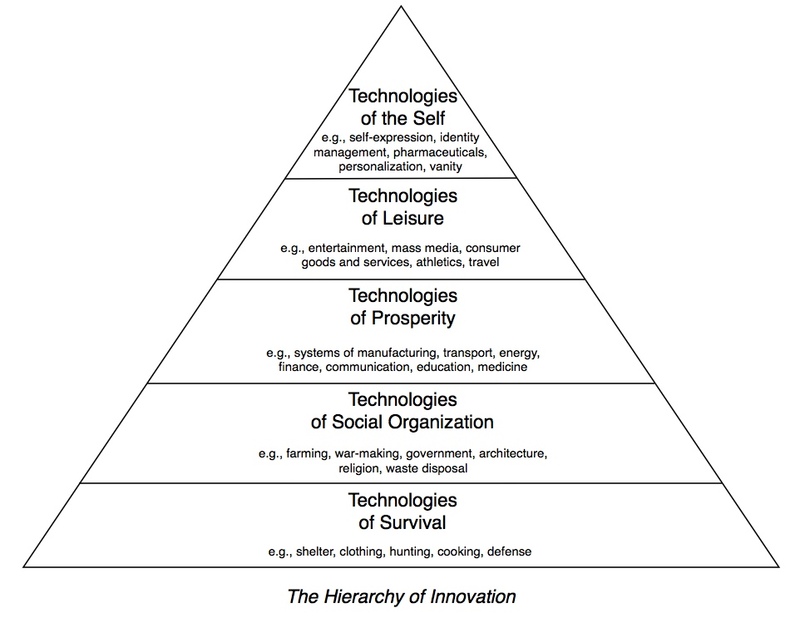 I like the hierarchy concept and think its a great 1st order mechanism to understand the underlying social values driving innovation at any given stage in civil development. I think there are probably other second order and maybe deeper drivers that are also worth considering. The one I’m most familiar with relates to the ability of a civilization to harness energy to drive the economic wealth and ultimately wealthy lifestyles, which push them up the 1st order innovation pyramid. Most of the 19th and early 20th century innovations highlighted in the article relate directly to or result directly from a radical revolution in humankind’s ability to harness energy for its own benefit. Prior to the industrial revolution energy for economic production came primarily from livestock and human labor. By the mid 19th century western civilization was pushing on the very capacity of those energy producing technologies to sustain the economic growth and wealth creation demanded by its societies; setting the stage for the Industrial Revolution. With the industrial Revolution, humankind harnessed the power of fossil fuels and unleashed an entirely new paradigm of production and economic wealth generation. This created the energy production “headroom” that set the stage for the massive change in human capabilities in the early to mid 20th century. In fact and quite literally, without the energy technologies and production capacity we developed 100- 150 years ago we never could have escaped the bounds of the earth and started our exploration of the Solar System. However, sometime mid century as we achieved new heights of global economic prosperity we stopped innovating on energy and moved up the innovation hierarchy to focus on leisure and self. Presently, 125 years later, civilization is still reliant on the core energy production technologies created in the Industrial revolution. Economies with the mastery and control of those technologies enjoy almost unlimited access to abundant and cheap energy and it is in those societies that we see the shift in innovation so lamented by Gordon, Fox and others. Yet, the current energy paradigm, not so unlike the one based on livestock and human power, is fundamentally based on commodity fuels and highly fragmented production and distribution industries that can be owned and controlled (usually to their own benefit) by anyone with the resources and power to do to so. As such, the paradigm is defines by energy have’s and have-nots; and the energy have-nots are consistently plagued by crushing poverty and disease and the disparity is growing rapidly. On a global basis, this imbalance is likely coming to a critical point and, like the mid 19th century, the stage is formally be set for another innovation in energy production, one that frees us from the burdens and challenges of fossil fuels and unleashes another unprecedented transformation in economies and ultimately the human condition. I’ve heard the “We’re not innovating anymore” thing before and thought about it, but I’m not buying it. 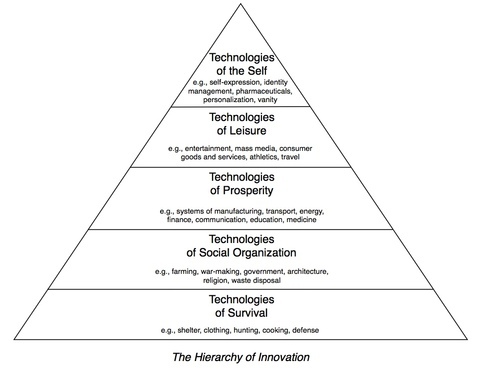 I think your hierarchy might be accurate from a societal point of view, but it has little to do with technology (if it did, China and India would be producing all of the “prosperity technology”). In fact, we know a lot about how technology evolves and you’ve only taken on the demand side and haven’t addressed supply (see http://www.digitaltonto.com/2011/how-technology-evolves/). My personal opinion is that people who say that we not innovating are looking in the wrong places. At the beginning of a new paradigm, nothing of use is produced (who knew what a transistor was until they started making radios in the 1970’s – nearly 30 years after the invention). Digital technology looks trivial because we are at the end of the paradigm. A new one will being in the next decade and no one will notice because most of us will still be using the old stuff. But if you look at other paradigms, like genomics, nanotechnology and artificial intelligence, the progress is quite rapid and just entering the heyday of productivity. I recall discussions around discoveries at the end of the last century, and the consensus was the first half of the 20th century provide significant advances in the physical sciences (culminating with mastering the atom), while the second half resulted in advances in the life sciences (culminating in mapping the human genome). I like the new version of the pyramid. Maslov’s canonical version always struck me as wrong; I could see in 3rd world countries that after food and shelter, people pursued television–not self-actualization! Lastly, I think you hit the nail on the head that today’s technology is not “changing the shape of the physical world or even of society… We’re altering internal states, transforming the invisible self.” Media (and even drugs) are the new frontiers of innovation, not the world of things. a) We are capable of today. We know enough to do it. b) We don’t do it, because it isn’t a perceived need. c) Later, we regret not having made the innovation earlier. We only objectively recognize latent needs in hindsight, as a kind of tragedy. Here is an example: We’re starting to recognize that our technologies of large scale agriculture create problems of oil dependency, soil loss, GMO escapes, and so forth. We should regret not having, long ago, innovating on technologies of food production without these problems: but the techniques we stuck with instead were very successful in the market because (for a time) they create an abundance of inexpensive food. So there is an example of a latent need squarely in the bottom of the triangle: a technology of survival. We’ve blown and we’re blowing it by not innovating at all aggressively enough in that area to prevent disaster. Disasters are unfolding. I think it’s easy to come up with a long list of known or easily predicted latent needs, far down the hierarchy. In the 19th century, agricultural innovation was gold. Many could see the need and the markets were responsive today. These days, much fewer see the need and the need is not reflected much in the markets. So a puzzle to contemplate is when and where our perceived needs and latent needs diverge, as that divergence is happening. We don’t (as a mass) know what we “really” need: why is that? I find myself wanting to venture an answer in quasi-Marxist terms: I blame the alienation of workers from their labor, and their segregation from, and resulting ignorance of, the means of production of the basic elements of survival. For a typical worker, satisfying survival needs means earning some money and going to the grocery store, for example. Is this worker more likely to buy an iPhone or a grey water recycling system for a victory garden? An iPhone or a sewing machine? Two factors seem to drive this alienation with positive feedback: (1) the globalization of capital and trade; (2) technologies of distraction. Technologies of distraction (c.f. The Shallows): keep us from feeling too nervous about that. Perhaps supporting evidence can be found by looking at areas of “frustrated innovation”: areas where there are innovators doing work further down the Maslow hierarchy — but unable to get very much traction. The interesting cases are in areas where we suspect the frustrated innovation will, further down the road, be recognized in hindsight as a lamented latent need. The collapseniks (if you know who I mean, and I’d tentatively include myself) don’t see this alienation likely to correct in any smooth way. Looking at energy, environment and so forth — the collapsenik hypothesis is that we’re headed for a crush at which time will “suddenly” recognize a large number of latent needs, well down the Maslow hierarchy. Great article, no doubt. I love your hierarchy. However, “he inventions have less visible, less transformative effects. We’re no longer changing the shape of the physical world or even of society”? Really? I live in the Canary Islands, in Spain, quite far away from where this article was published. However, I was able to read it as soon as you published (even if it has taken me 14 days to getting around to reading it in depth and answering). Knowledge and education are in front of the biggest change ever, in the history of humanity. Difussion of education is taking place as is going to take place in a way that we have never seen before. And this will affect not only the mid level of the hierarchy, but I believe that every level of it. I think the shape of the physical world IS changing. These statements reflect at least two important misunderstandings unrelated to the question of whether incumbent fuel produces squash incipient technologies (which the most assuredly do, sometimes with underhanded tactics, but also just by benefiting from path dependence and 1.5 centuries of technological progress–Wind and solar would be a lot cheaper also if we’d been relying on them since the mid 1800s) . First, wind generation of electricity is currently cheaper than coal generation (both new and existing) from the societal perspective, when you correctly include externality costs like pollution and land disruption from coal mining (Epstein et al. 2011 and Muller et al. 2011) as well as the backup costs for wind generation. If you just compare the costs to the utility, wind isn’t always competitive with existing coal plants, but is competitive with new coal plants almost everywhere. But the societal metric is the more relevant one. Second, the potential for wind generated electricity is huge, and the US resources is at least as big as the total electricity use of the US, and the global resource is much more than global electricity consumption (Archer and Jacobson 2005). That doesn’t mean you could run the entire grid off of wind without substantial investments in storage and operational changes, but it does indicate that the resource is not limited in the way indicated by the poster’s statements. And that’s not even counting the potential for solar (http://en.wikipedia.org/wiki/Solar_energy) or geothermal (http://www.google.org/egs/), which have substantially larger resource bases. Muller, Nicholas Z., Robert Mendelsohn, and William Nordhaus. 2011. “Environmental Accounting for Pollution in the United States Economy.” American Economic Review vol. 101, no. 5. August. pp. 1649–1675. Thanks. I hadn’t thought of it before, but I think you’re right that as perceived needs move up the pyramid, latent ones build up lower down. Besides the alienation factor, I think that once a perceived need is felt to be sufficiently fulfilled, the only thing that society wants is to continually push down the cost to keep the need fulfilled. That releases more money (and time) to devote to pursuing the needs further up the pyramid. Society finds it very hard, as a result, to foster any further innovation around the need if it raises the cost (in money or time) even slightly or for even a short amount of time. So further innovations that would provide long-term societal benefits get foreclosed. Nick, nice way to depict the variety of innovations. In research for my recent book, The New Technology Elite, I had thought I would catalog maybe 10-15 industries which were embedding tech (web, sensors, telemetry etc) in their products like med devices and autos. I ended up with 75 industries working on smart products and services – smart showers, shoes, auto insurance, govt services etc which would cover your hierarchical spectrum. What you need in addition is something to depict industrial innovation. in my previous book, The New Polymath, i cataloged GE, BASF and many others as they blend strands of infotech, biotech, cleantech, healthtech to create new solutions we could not a decade ago.